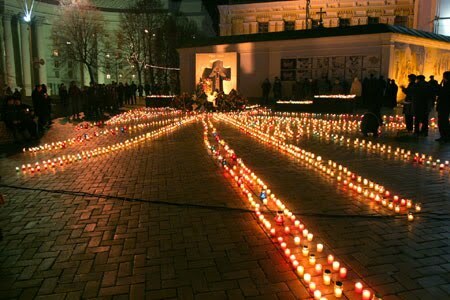 KIEV, Ukraine -- Ukraine commemorated yesterday the victims of the Great Famine (Holodomor) 1932-1933 and the 77th anniversary of the Holodomor. The Day of Remembrance of Victims of the Holodomor and Political Repressions in Ukraine is marked every year on the fourth Saturday of November annually. In 2006, the Verkhovna Rada of Ukraine recognized the Holodomor 1932-33 as a genocide of the Ukrainian people, it was also recognized as a genocide by another 15 countries. By different estimates, the artificial famine or the Holodomor, organized in Ukraine by the Stalin totalitarian regime at the expense of confiscation of foodstuffs from peasants, took away the lives of from 7 million to 10 million of Ukrainian residents. President Viktor Yanukovych has called the Great Famine a targeted crime of Stalin's regime. "This is a terrible event in the history of the Ukrainian people, in the history of Ukraine's neighboring peoples - Belarusians, Russians and Kazakhs. It was really a targeted crime against own people. These were our ancestors, these were people lost by their country, lost by their families, and this memory for a modern society remains holy," he emphasized. "We will always condemn the regime of Stalin, who committed this crime" Yanukovych stressed, UKRINFORM reports. Foreign Minister of Ukraine Kostiantyn Hryshchenko thanks the countries and the peoples assisting in renewal of the memory about the Holodomor 1932-1933 in Ukraine. He appreciated efforts of the Ukrainians abroad on the spread of truth about the reasons and consequences of the Holodomor and addressed the words of gratitude to all the countries and the peoples, sharing our grief and assisting in renewal and preservation of remembrance about the experienced hard times. "Our sacred duty today and in the future is to make everything possible so that remembrance about the Ukrainians and representatives of other nations, who died of the artificial hunger, remained alive for the present and the future generations, being a warning for the future," the address emphasizes. The Security Service of Ukraine (SBU), with the assistance of Ukrainian institutions and civil society organizations, has issued a scientific handbook, entitled "The Holodomor of 1932-1933 in Ukraine According to the Documents of the Branch State Archive of the Security Service of Ukraine: An Annotated Handbook." The book is the first edition of the complete list of all declassified documents of the SBU's Branch State Archive on the Holodomor of 1932-1933 in Ukraine, which cover the causes and consequences of this tragedy. In general, the handbook includes annotations to 420 documents, name and geographical directories pointing to people, villages, and regions mentioned in the archival documents. The book also contains the signatures to secret documents, regulatory and administrative documents, the archival materials of criminal cases, agent documents, personal documents, postcards, the memories of witnesses and their descendants. This blog *could* be considered serious and relevant if it didn't have any of those crappy ads such as "anastasia date dot com". What a shame!